The tragic story of the father of oceanography. Nature writer Dobbs (The Great Gulf, not reviewed) examines an obscure side battle in the 19th-century war of words between empirical science and creationism. 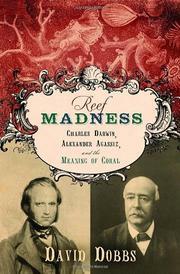 The dispute between Alexander Agassiz and Charles Darwin over how coral reefs form has an unexpected twist: Darwin was in the corner of shoddy reasoning, while Agassiz, son of Darwin’s great rival Louis Agassiz, sought to explain the world not by idealistic theories but from the evidence his research uncovered. Arrogant Louis Agassiz was one of the first natural scientists at Harvard and an advocate of “fixity,” the concept that God created the species as they are. Growing up, Alexander hobnobbed with the greatest minds in Europe and the US, including Emerson, Thoreau, and William James. But when Darwin’s theory of evolution began to discredit his father’s beliefs, the young Agassiz embraced empiricism (the strict interpretation of facts) and slowly accepted Darwin’s notions about the arbitrary nature of species. Alexander became a scientist and turned to the study of sea life; he eventually grew convinced that Darwin’s theories about sea coral formation were wrong. These theories, among Darwin’s first published works, didn’t exhibit the meticulous research that marked The Origin of Species in 1859. Yet while Alexander studied reefs from the Galapagos to Fiji, he lacked the drilling technology necessary to disprove Darwin’s thesis that reefs grew atop sunken volcanoes. As a result, his determination to upend those theories using the same empirical tools Darwin expounded was often frustrated. He never published his findings, but his research laid the groundwork for a new branch of science. Dobbs imbues his characters with the Victorian tensions that drove their explorations, creating drama out of a story that involves little more than men closely observing small creatures. A valuable contribution to the debates still surrounding some giants of modern science, though the particulars are fairly obscure. Maybe the silly title will draw in a few additional readers.